Grumolo chicory has always fascinated me since childhood. In the fall we would chose a piece of the field and were we seeded varieties of radicchio and spinach that were resistant to the cold of winter. These seeds could germinate before winter, but during the cold season the whole plot seemed to be resting helpless. In the spring after the first rains everything was magically reborn. Among the various radicchio and spinach, the green grumolo was a marvel with its heart-shaped roses. I was taught to pick it with its little root attached and I did it with amusement. This chicory is also also sold in grocery stores. I recommend you experience it, it is a vegetable that is a complete dish. It will fill you with energy and is very healthy. Clean the radicchio and leaf through it. Dry it and place it on individual plates. 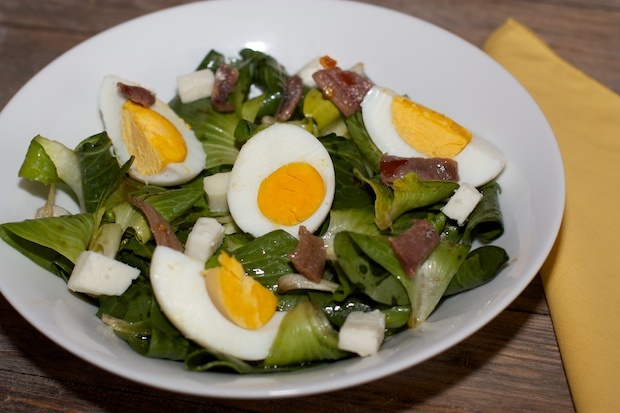 Cut, after having peeled, the hard-boiled eggs into 4 wedges and place them on each salad portion. Chop the anchovies, cut the cheese into cubes and distribute them both on the vegetables. Mix with olive oil with a little salt and a little pepper. Pour a spoon over each serving. Serve immediately. Posted in Recipes, Salads. RSS 2.0 feed.